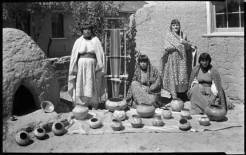 A new pottery style emerged in the 1930’s under the direction of Regina Cata, a woman of Spanish decent who had married into the pueblo. 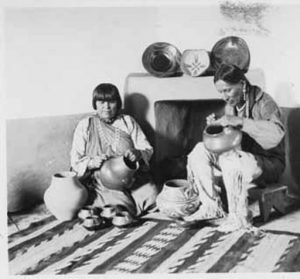 According to a friend of Regina’s Maurine Grammer it was the superintendent of the Santa Fe Indian School, Chester Faris who encouraged Regina to revive pottery making at the San Juan Pueblo. Regina organized a group of women potters: Reyecita A. Trujillo, Tomasita Montoya, Luteria Atencio, Crucita Trujillo, Crucita A. Talachy, Gregocita Cruz, and one other potter whose name no one seems to remember. The potters studied ancient Potsuwi’i incised pottery shards dating from around 1450-1500. The shards had been discovered in the abandoned ancestral village of San Juan, across the Rio Grande from the current pueblo. This new style of pottery was heavier more like Santa Clara pottery; it consisted entirely of redware. The unpolished underbodies of the pots were painted and the midbody had a matte band. The matte band became the mural space, to be carved and painted with natural slips. The band was either carved and decorated with red, buff, and white matte paints or incised with a micaceous slip, which is applied before the firing of the pot. Designs are typically geometric patterns, flowers, feathers, kiva steps, spirals, rainbows and sun/cloud patterns. On exhibit at the Luther Bean Museum are pots made by Reyecita A. Trujillo (active c. 1925-45) and Tomasita Montoya (1899-1978). Reyecita made the largest revival pottery pieces and is noted for her incised technique inspired by Potsuwi’i. Tomasita is known for her incised polychrome redware jars, bowls, and vases. Decoration of her vessel included clouds, kival steps, triangular fret and fine line hatching. Reyecita A. Trujillo (active c. 1925-45). 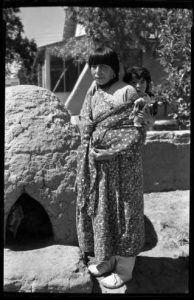 San Juan Pueblo/Ohkay Owingeh. Jar, 1930s/40s. Red, tan, and beige on tan clay, burnished. 32.8 x 41.4 cm. (dia.) Gift of Dr. F. C. Spencer. 1945.1.15. Tomasita was known for her incised polychrome redware jars, bowls and vases. Decoration of her vessels included clouds, kival steps, triangular fret and fine line. Batkin, Jonathan. Pottery of the Pueblos of New Mexico 1700-1940. The Taylor Museum of the Colorado Springs Fine Arts Center. 1987. Hayes, Allan and John Blom. Southwestern Pottery Anasazi to Zuni. Northland Publishing. 1996. It is a wonderful feeling when you have a list of jobs that need to be done and you can cross some of them off your list! That is exactly what I did this last week; I crossed off a few items from my list at the museum. Inventory sheets for the vessels in the Mezzanine level…printed and filed…DONE! Photographs of these vessels…printed and filed…DONE! Labels for these vessels…printed and displayed be each vessel…DONE! San Juan Revival information for flip book…DONE! I hope you can cross some things off your to do list. Best of Luck! Happy Easter and God Bless.